Tendons in the fingers and hand can become inflamed and painful from either one-time events or ongoing activities. Dr. Peter G. Fitzgibbons, MD at The Centers for Advanced Orthopaedics: Maryland Orthopedic Specialists Division performed fellowship-training in hand, wrist, and elbow surgery through the Harvard Hand & Upper Extremity Fellowship based at Brigham & Women’s Hospital in Boston. 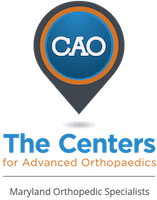 Withlocations in both Germantown and Bethesda, Maryland, he and a team of orthopaedists, hand therapists, and physical therapists offer a comprehensive range of services covering the diagnosis and treatment of tendonitis in the hand. Tendons are like ropes that connect muscles to bones and allow joints to move. Tendons in the hand and fingers have a lining that can become inflamed causing pain and/or swelling. A general principle with tendon inflammation is trying to decrease mechanical irritation of the tendon with either splint or minimizing certain activities. Over-the-counter anti-inflammatory medications can help, as can short courses of oral steroids or cortisone injections. Sometimes hand therapy can help to alleviate symptoms. Is there surgery for tendonitis? If conservative approaches are not managing symptoms, some forms of tendonitis can be treated with surgery to take pressure or tension off of tendons and allow them to heal. Dr. Fitzgibbons performs most of these procedures at the Massachusetts Avenue Surgery Center, an outpatient surgery center that provides a safe, patient-oriented experience in a friendly and comfortable environment.